Yoseikan Budo is a Japanese martial art founded by Minoru Mochizuki. Minoru Mochizuki, born in 1907, started judo at KODOKAN in 1926, practiced with Kyuzo MIFUNE. In 1928, he began to practice Iaido (with NAKAYAMA Hakudo), Ken jutsu (KATORI SHINTO RYU), Bo jutsu and Jujitsu. In 1930, he started Aikido with Ueshiba Morihei recommended by Kano Jigoro. In 1931, he created his dojo in Shizuoka YOSEIKAN DOJO and starting giving lessons to policemen and militaries. In 1938, he became the consul in Mongolian, gave lessons of Japanese martial arts. After a breaf transit to Japan in 1946, he came to France in 1951 and stayed for 1 year. In 1956, he promoted to 5th dan Kendo and Jodo 5th dan. He got the 7th dan Kodokan Judo in 1959. In 1976, he was appointed as an instructor at Zen Nihon Kodan Sha Judo Kai (The High-ranking member of Japan Judo). He settled down in France in 1999 and died on May 30th 2003. Yoseikan Aikido There are 4 products. 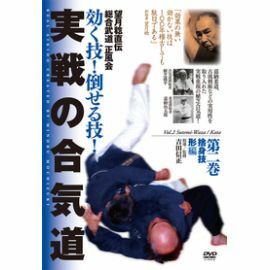 DVD Yoseikan sogo budo No 1 - Minoru Mochizuki Language : Japanese 45mn Minoru Mochizuki was a pupil of Morihei Ueshiba (AIKIDO), Kyuzo MIFUNE and Jigoro KANO (JUDO). He is the founder of YOSEIKAN Budo Sogo. Jissen no Aikido- Nobumasa YOSHIDA63mn Language:Japanese Nobumasa YOSHIDA is a pupil of Minoru Mochizuki, he is the president of SEIFUKAI AIKIDO. Jissen no Aikido Vol 2 - Nobumasa YOSHIDA 51mn Language:Japanese Nobumasa YOSHIDA is a pupil of Minoru Mochizuki, he is the president of SEIFUKAI AIKIDO.